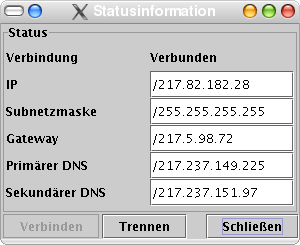 jOnlineControl is a dsl router status program exactly like that windows tool "onlineControl" from the german provider "Telekom" - but for Windows AND Linux AND Mac. 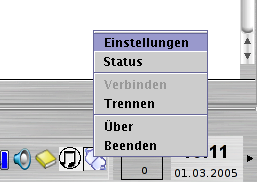 It sits in the system tray and tells you the connection status just by the icon. You also can view the current router status (IP, gateway, DNS) in an extra window and cause the router to connect to or disconnect from the internet. English and German translation included; they will be automatically selected depending on your operating system settings. Note that it will work with some Telekom routers only; I have the "Sinus 1054 DSL". It should work with "Sinus 154 DSL" as well, but I had no chance to test it. 90% of the code have been rewritten for version 0.6 "Brombeere". There are different frontends now: The normal tray, a window if there is no tray and a command line one. Two new drivers have been added, a "Ping" driver that tells you if a host responds to ping packets, and one for AVM's FritzBox (using UPnP). You can use jOnlineControl on the Mac: Download the linux version, extract it and remove jdic.jar and libtray.so. This is just a small test program for IML (Ink Markup Language) files. The channels are internally supported, but only the "normal" X and Y channels are used (And files with more than 2 position channels will cause errors). Buttons are ignored by now. 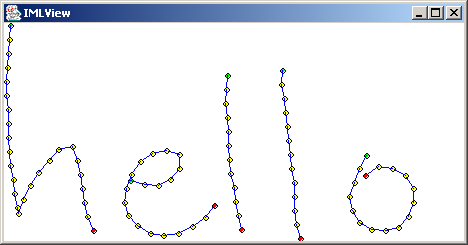 All the trace notations are fully supported. If you want to open a file, drop it onto the viewer window. The work is based on the w3c working draft from 6th august 2003. That's annoying, and so I've written a small utility which writes all options into one big file, the kernel map. You can search through this textfile and find the path to the needed option.